Not jazz, but modern composition. Anthony Braxton does not himself perform on this record. It is reminiscent of Arnold Schönberg, and also kind of presages things like Scott Walker‘s The Drift in its ritualistic elements. The performers play piano as well as melodica and zither, and perform in floor-length hooded cloaks. 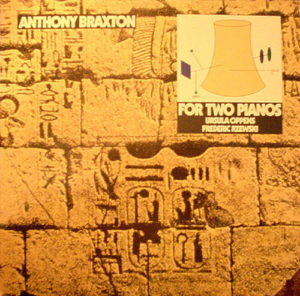 This is one of the most effective recordings of a Braxton “classical” (non-jazz) composition, partly because with just two performers there are less rehearsal demands (or at least ones that fit into the recording budget). Highly recommended.